The Strand was founded in 1927, which means it celebrated its 90th birthday last year. Any person, place, or thing that has been around for 90 years has a LOT of history, and you can read all about the Strand’s origins on their website, from which I’ve culled most of my information. You can also watch this great video featuring Fred Bass, who co-owned and managed the store for more than 30 years (and sadly passed away this year at 89 years old, may he rest peacefully). To give you a little summary: the Strand Book Store was originally located on 4th Avenue, and was one of 48 bookstores covering six city blocks of what was then called “Book Row” in Greenwich Village. The store was founded by a 25-year-old entrepreneur named Ben Bass, who’s son, Fred, started learning the business at 13. Eventually, Fred took over, and in 1957 moved the store to its current location at 12th & Broadway. According to the website, the Strand is now the sole survivor of Book Row’s “colorful past” (which is an oddly sinister way to describe a street full of bookshops). Fred went on to manage the Strand for 30 years. The store is still in the Bass family today, owned and managed by Nancy Bass Wyden, Fred’s daughter! Over the years, the Strand’s collection has only grown, and today the store is home to over 2.5 million used, new, and rare books — 18 miles worth, roughly, if you’re the kind of person who measures books that way. a handy timeline you can check out on your way down to the basement! The Strand is a BIG bookstore, especially for being an indie. 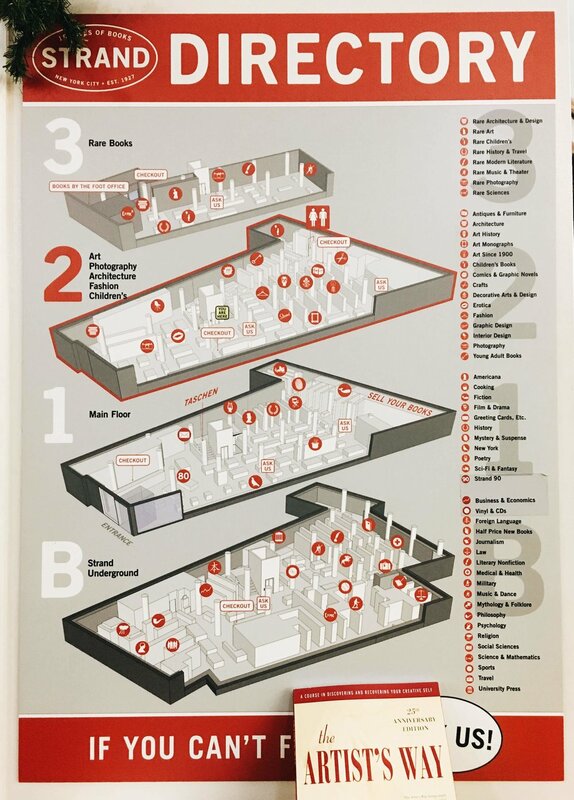 It’s part of what makes the experience of going there so much fun; with four floors and over 50 book sections, the place is genuinely labyrinthian, and you could easily spend as much time browsing the Strand’s shelves and gifts as you might spend at a museum. 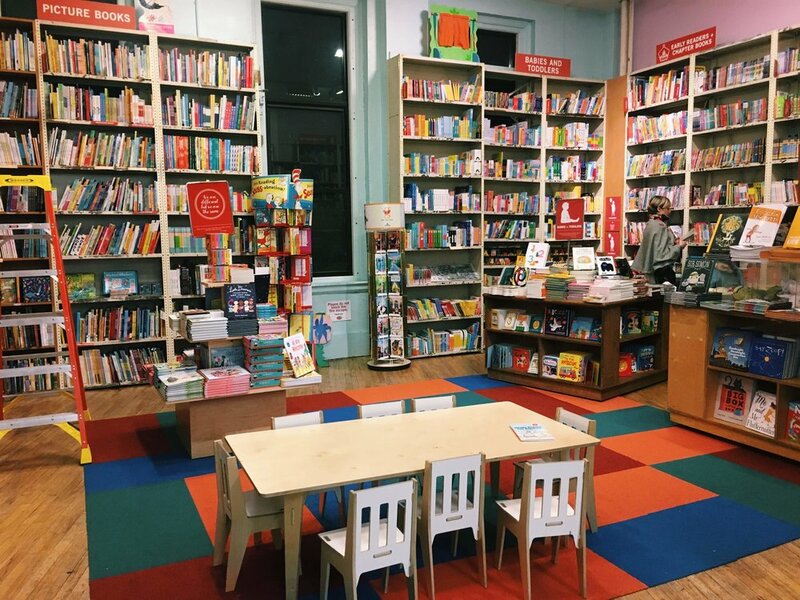 Luckily, if you’re not trying to kill four hours in a book-induced haze, the Strand has a huge number of display tables with convenient labels that can help you find what you’re looking for — even if you don’t know what exactly you’re looking for. Most bookstores have displays of books like this, from a ‘most popular’ table to the classics, but the Strand takes it a step further. Because they have so much space, the first floor is largely comprised of these tables, and they are able to be incredibly specific in their categories. My favorite table is one called “The Best of the Best (Bestselling, Award-Winning, and Brand New).” This table features books across all genres and all years, and is positioned right at the front of the store — basically, an excellent place to start. Often, if I’m in search of a book that I’m hearing buzz about, it’ll be on that table, which makes my trip to the store short, sweet, and easy. On the flip-side, if I just want something new to read, the Best of the Best table is guaranteed to have at least one pick aligned with my taste — or anyone else’s. In addition to the tables stacked with new books, the Strand also has a huge selection of used books on its shelves. The used books are discounted depending on their condition, but in my experience, they’re usually around 30-50% cheaper than new copies with very minimal damage. You can also bring in your own used books to sell, as long as they’re in decent condition. It’s a great option for the person is too possessive to use a library card but too cheap to buy used hardcovers (see also: me). Staff recs; spot the BSG pick! These events are all held in the same section of the bookstore: the Strand’s Rare Book Room, which houses a large collection of beautiful antique books, ranging in price from less than a hundred to several thousand dollars. The rare books are available for supervised browsing during the day, as well as in the downtime during events (like when you’re waiting three hours to get your book signed by David Sedaris, for example). Right now, they have an original copy of the literary magazine in which Edgar Allan Poe’s “The Tell-Tale Heart” was first published in 1843. Another notable thing about the Strand is its gift shop — and by “gift shop,” I mean the hundreds of fun and adorable items scattered about the store for purchase. The Strand has stationery and cards, mugs, candles, SO many socks, pins, hats, t-shirts, tote bags (my GOD, the tote bags), soap, tiny garden kits, finger puppets, figurines, bookmarks, mints, and the list goes on and on and on forever. Some people might think it’s a cop-out for a bookstore to sell so many non-book items, but to those people, I say: who made you so sad and boring, and how can you possibly resist mechanical pencils topped with small animals? The Strand also offers an unusual service called Books by the Foot, where store experts create custom, one-of-a-kind book collections for purchase or rental — whether it’s for something like an interior background in a catalogue photoshoot, or for your own personal library for your home. You can read more about the service here. As usual, this post is getting excessively long, and I’m sorry. It’s just that this store is massive, and it has so much to offer, and it’s been around forever, and I love it very deeply. I’ll take this opportunity to thank BSG contributor (and friend) Gabriella, who brought me to the Strand for the very first time when I visited the city in 2012, like every good New Yorker who has a visitor SHOULD. If you live in New York, you probably stopped reading this 500 words ago, but if you don’t and happen to find yourself in the city, please, PLEASE pay a visit to this wonderful institution. Buy yourself a book, and don’t deny yourself the pleasure of a beautiful tote bag or an enamel pin featuring two otters holding hands. You deserve it.